Published: Sept. 11, 2013 at 10:51 p.m. 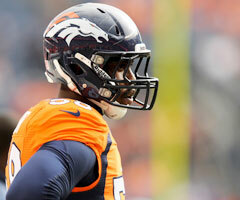 Updated: Sept. 12, 2013 at 12:08 p.m.
More trouble for Von Miller. Orange County, Calif., court records show that the suspended Denver Broncos linebacker was cited for speeding on March 8, 2012, and didn't appear for a mandatory court date on July 9, 2012. Miller currently is one game into a six-game suspension he received for violating the NFL's substance-abuse policy. News of the California ticket came to light shortly after it was learned Miller was cited last week for driving without a license and speeding in Colorado. Miller also was arrested in August in Colorado after a background check showed he had a warrant for failure to appear in an October 2012 citation for careless driving, driving without a license and no proof of insurance. "Obviously we're not happy about it," Broncos coach John Fox said Wednesday about the most recent Colorado citation. "Everybody here has an individual responsibility, not only to themselves, but to this organization, to this football team, so it's something we're not pleased about. We'll leave it at that." Reports surfaced late Wednesday that Miller was facing a bench warrant in Orange County. Susan Schroeder, chief of staff for the Orange County District Attorney's Office, told NFL Media and other news outlets on Wednesday that court records show a bench warrant had been issued over Miller's failure to appear. Miller's attorney, Mark Schamel of the Washington, D.C.-based firm of Womble Carlyle Sandridge & Rice, denied that report. "He (Miller) was ticketed for driving 10 mph over the posted speed limit. 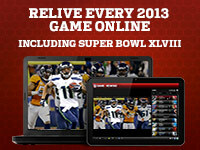 There is nothing more to it than that," Schamel said in a statement given to NFL Media. "The speeding ticket is a simple infraction for which arrest is not authorized. This is not a criminal case and we have confirmed that there is no warrant for his arrest." Schroeder later told NFL Media she "can't tell" if there was a bench warrant issued for Miller. "We are looking into the report," Broncos spokesman Patrick Smyth told NFL Media via email. The Broncos must be wondering if Miller will incur further league discipline for his actions during his suspension. Miller continues to be a distraction to a Broncos team that's trying to make do without him.